This plant has a very unique bloom as it appears part of the way down the stem. The flower is medium in size but has a large amount of color. 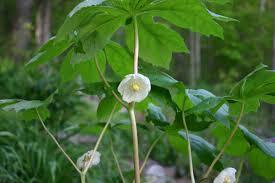 Mayapple is a herbaceous, perennial plant native to North America. 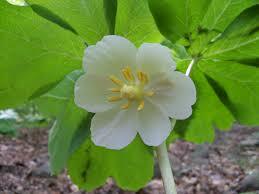 Mayapples commonly grow in the eastern United States and southeastern Canada. These plants prefer woodland locations, growing in colonies all stemming from a single root. The stem is 30 to 40 cm tall, but the distinguishing characteristic is their leaves. Mayapples have large, umbrella-like leaves. 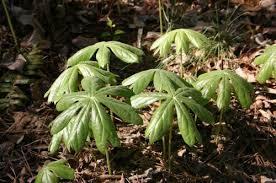 Each plant can have three to nine leaves, creating a diameter of 20 to 40 cm. Some plants produce a white, yellow, or red flower with six to nine petals. May Apple plants would make a lovely addition to any landscape. May Apple Plants is an excellent natural herb. May Apple can be used to remove warts and moles from the skin when used under the supervision of a professional herbalist. It can also be used to help with liver problems when used by physicians. The roots and leaves, however, are somewhat poisonous so best to avoid them. It will go dormant in the summer much like most early spring bloomers. It has no severe disease or insect problems, but it is not considered as an excellent border plant. It will also self-seed under optimum growing conditions and would best be suited to a wild plant garden. It will even tolerate dry poorer soils and drought. As this flower grows, it appears as little small umbrellas were growing in a garden and then displays beautiful white blooms during April. May Apple Plants looks impressive when added to gardens and natural areas and also creates a gorgeous natural look and feel to areas where planted. This plant loves to plant in soils that are rich and humusy and are also well drained. The plant made up of five or six green leaves, and the flower will appear underneath the blades when in bloom. They can be seen growing random in wooded locations that provide the right soils and lighting for them. These are great wildflowers and brightens up all gardens where they are planted.